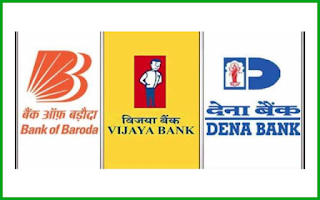 The two banks Vijaya Bank and Dena Bank is going to merge with Bank of Baroda (BOB) from April 1 2019. As per the amalgamation banking operations and accounts held by these banks will be transferred to BOB post merger. There will be few changes to be made for the customers of Vijaya Bank and Dena Bank. According to the Scheme of Amalgamation Vijaya Bank Shareholders will get 402 equity shares of BoB for every 1,000 shares held and Dena Bank shareholders will get 110 shares for every 1,000 shares of BoB. Checkout what need to be change for Vijaya Bank, Dena Bank & Bank of Baroda Customers. Where to change Bank Details for Vijaya Bank, Dena Bank & Bank of Baroda Customers. What will not change for Vijaya Bank, Dena Bank & Bank of Baroda Customers. Ahead of the merger Government will infuse Rs.5042 crore in Bank of Baroda by preferential allotment of equity shares of the bank during FY2018-19 as part of Government's investment. After this merger it will be the second biggest entity in Indian banking sector by assets and businesses.